Since the 1960s, the Space Coast has been Florida’s surfing mecca, attracting talent from across the East Coast. 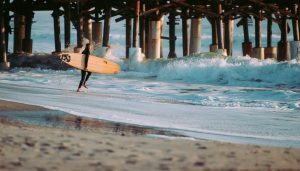 If you want to catch some waves while you’re visiting or shopping for apartments in the area, then head to one of these awesome surf spots in the Satellite Beach and Melbourne Beach areas. No surfing trip is complete without a visit to this beach, as it’s renowned throughout the country for its record-breaking waves. The park is also home to several major surfing competitions. For the biggest waves, head to the area around the jetty at First Peak. The area between 1st Street through 4th Street North and 1st Street through 30th Street South in Cocoa Beach might look like just homes and apartments. However, this area is where you can park for free and take advantage of the public access to one of the state’s best surfing beaches. Not only is this a great spot at high tide, but also it’s relatively uncrowded. Not far from the Sebastian Inlet, this area gets its name from the classic hacienda that serves as a landmark. You’ll find it at the first parking lot with beach access north of the Inlet. Those who find the house are rewarded with the ideal conditions of strong swell, especially during low tide. This family-friendly community beach featuring lifeguards, several pavilions, and a boardwalk, doubles as a hot Space Coast surf spot. While that might not seem like a natural pairing, the steep waves created here make it a no-brainer for surfers. Step back to the 70s with this classic party spot. Popular not just for its incredible waves, but also for its easy parking and amenities like picnic tables, showers, and bathrooms. Visit here when there’s a bit of a swell for ideal waves. Whether you’re looking for apartments in the Space Coast, are a lifetime resident, or you’re just visiting for the surfing, these five hang-ten spots can’t be missed.